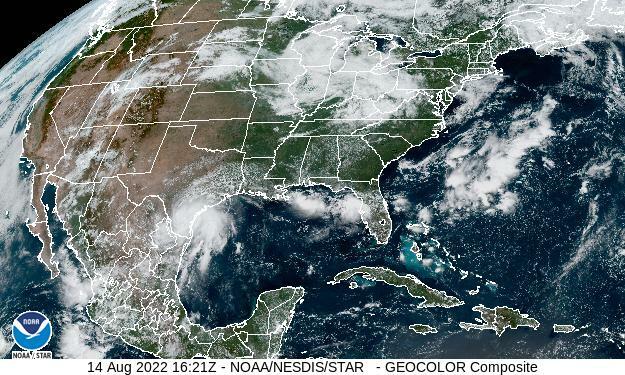 Lat: 42.23° N Lon: 83.33° W Elev: 636 ft.
Cloudy with rain likely in the morning, then mostly sunny with chance of rain showers and thunderstorms in the afternoon. Highs in the lower 60s. Northwest winds 15 to 20 mph. Gusts up to 40 mph in the afternoon. Chance of precipitation 70 percent. Breezy, colder. Mostly clear. Lows in the mid 30s. Northwest winds 15 to 25 mph. Gusts up to 40 mph in the evening. 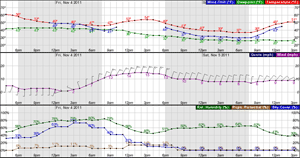 Sunny in the morning, then mostly cloudy with a 50 percent chance of rain in the afternoon. Highs in the lower 50s. West winds 5 to 15 mph. Snow, possibly mixed with rain. Accumulations possible. 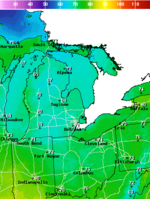 Lows in the mid 30s. Northeast winds 5 to 15 mph. Chance of precipitation near 100 percent. Mostly sunny. Highs in the lower 50s. Northeast winds 5 to 15 mph. Rain likely. Highs around 50. Chance of rain 70 percent. Mostly cloudy with a 40 percent chance of rain. Highs in the lower 60s.